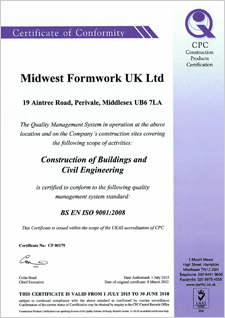 Midwest Formworks (UK) Ltd have been awarded many accreditations over the years, we constantly review and improve so we continue to stay ahead. Each month thousands of contractors and consultants (suppliers) apply for work with public and private sector organisations (buyers). To win work, they must meet the buyer's health and safety standards. 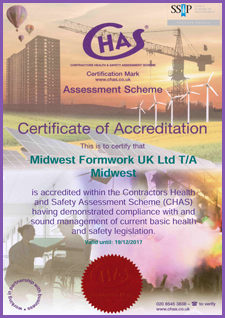 Assessing suppliers health and safety competence is usually a lengthy and time consuming process. Suppliers can sometimes meet one buyer's Health and Safety standards but not another. Being CHAS approved reduces duplication as suppliers compliance is accepted by all CHAS buyers. ISO 9000 is a series of standards, developed and published by the International Organization for Standardization (ISO), that define, establish, and maintain an effective quality assurance system for manufacturing and service industries. ISO 9001 deals with the requirements that organizations wishing to meet the standard must fulfill. Over a million organizations worldwide are independently certified, making ISO 9001 one of the most widely used management tools in the world today. 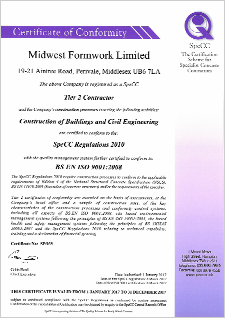 The Registration Scheme was created with a view to providing a mechanism for specialist concrete contractors to demonstrate a commitment to their clients that concrete structures, constructed by Registered Contractors, will fulfil their requirements and be constructed in an open and co-operative manner. The Scheme encourages a strong customer focus by the Registered Contractors and an operating environment in which Registered Contractors may establish ongoing improvements in their management and construction processes. 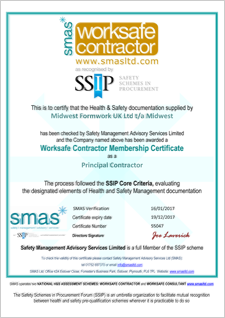 SMAS Worksafe Schemes offer a fast, efficient and cost effective way of demonstrating Health and Safety competence and gaining a nationally recognised SSIP Member Scheme certificate. 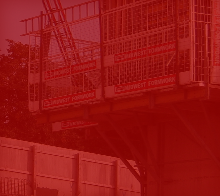 If you would like to know more information about Midwest Formwork (UK) Ltd, get in touch with us.